Many of New York City’s reservoirs and watershed lands are open to the public for fishing, hiking, boating and other types of outdoor recreation. Our interactive map can help outdoor enthusiasts find City-owned properties and understand the types of recreation that are permitted in each area. 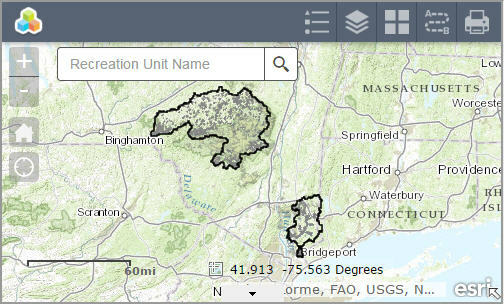 More than half of these lands are open to recreation without a permit, but recreation on the reservoirs and some lands will require a DEP Access Permit. We are updating the existing rules that govern recreational use of our water supply lands and reservoirs. Proposed rules were made available to the public for comments in July 2018. Revisions to the proposed rules will be announced soon. We are collaborating with Ulster County to construct the Ashokan Rail Trail along the northern shore of Ashokan Reservoir. While most areas will remain open for fishing season, there may be weekday restrictions at Gates E14 (Woodstock Dike) and W12 (Boiceville/Chimney Hole) to accommodate construction activities. There will not be any restrictions on weekends. Gate E14—Woodstock Dike Guidance: Please park in the lot closest to the access road and be sure to avoid any active constriction areas. In the event of access restrictions, the gate will be closed (please do not block it) or notices will be posted at the entrance. Please avoid any active construction areas. Gate W12—Boiceville/Chimney Hole Area Guidance: Access to this site is available by entering the access road at the gate off of 28A. Please park in designated spaces only as to not impede any construction activity traffic. During heavy construction activity, this area may be closed. If only parking restrictions are in place, anglers will be asked to park along the road and not block the gate. Please see the access map for more guidance on access to this site. Portions of the following recreational units will be temporarily closed to public access for completion of forest management projects. The lands outside the project areas in these recreational units will remain open to recreational use. Under no circumstances should you enter these closed areas or come within 300 feet of active work. Signs that mark these project areas and clarify restrictions are posted. Mile Shore Recreational Unit: Ashokan Reservoir, Town of Hurley, Ulster County. 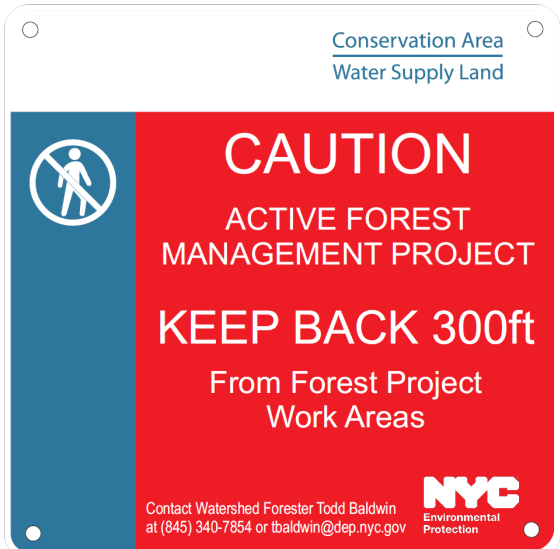 Approximately 76 acres located on the east end of the unit, including gates E22A and E-23 in the vicinity of Torino’s Cove, will be subject to closure for completion of forest management work. Shavertown Recreation Unit: Pepacton Reservoir, Town of Andes, Delaware County. 163 acres of this unit will be temporarily closed for completion of a forest management project to mitigate damage from the invasive exotic pest, emerald ash borer. The areas that will be closed include sections of the Shavertown Trail along the gravel road to Snake Pond as well as lands and trails above Snake Pond. The Snake Pond Loop Trail will remain open during the project and is now accessed by a well-marked alternate route from the intersection with the forest road to the junction with the pond loop trail. Please contact Collin Miller, Watershed Forester at (607) 363-9010 with any questions. Long Pond Recreational Unit: Long Pond Recreational Unit, Town of Carmel, Putnam County. Beginning April 22, the 32 Acre Long Pond Recreational Unit will be closed to recreational use as construction work is completed on the Willow Pond spillway. Work is expected to be completed by mid-May 2019. Enhanced recreational use of City-owned water supply lands is allowed in accordance with specific recreational rules and regulations. DEP issues a comprehensive access permit that allows for hiking and fishing on certain designated lands in the watershed. Boating for the purposes of fishing is allowed on New York City reservoirs to registered individuals that have the appropriate DEP access permit and boat tag. 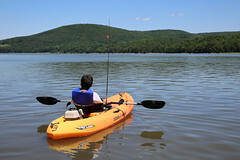 Recreational boats including, kayaks, canoes, rowboats, sculls or sail boats are also allowed on Cannonsville, Neversink, Pepacton and Schoharie Reservoirs. You do not have to be actively fishing to participate in this program. Hiking (including cross country skiing and snowshoeing) is allowed on many City-owned properties that are marked and designated for these purposes. Big and small game hunting as well as trapping is allowed on designated City-owned water supply lands as permitted by New York State regulations. Fishing is allowed on City-owned reservoirs, lakes and streams as designated by specific DEP signs and according to all applicable New York State regulations. Most City-owned reservoirs offer excellent fishing opportunities for both warm-water species such as bass and cold-water species such as trout. 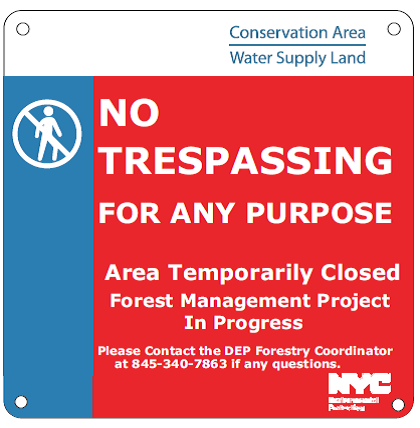 DEP issues free permits for New York State Certified Outdoor Guides, to operate on New York City water supply lands and reservoirs that are open for public recreation. For more information regarding New York State Certified Outdoor Guide Services, check out the New York State Outdoor Guide Service Association website. If you are a New York State Certified Guide and wish to learn more about applying for the guide service permit, please call 1-800-575-LAND (5263) or e-mail us at Recreation@dep.nyc.gov. Agricultural uses of City-owned watershed lands is allowed when these uses are compatible with water quality protection. DEP also promotes long-term management of City-owned watershed forests through regular forest improvement and restoration projects. Land Use Permits are issued to applicants who request the temporary use of City-owned water supply lands for specific proposed activities such as the maintenance of utility lines or special projects such as recreational trails or ball fields. DEP also allows certain uses of City-owned land for short-term, low impact activities such as fund-raising events or scientific studies.